This sector is the north-western part of the Defence Line. Located along Side canal G of the North Sea canal near the village Zaandam. Used for storage of artillery and other materials. The house/office building is still present but the wooden shed is demolished. Located to the east of the village Zaandam. Used for the storage of ammunition for this sector. 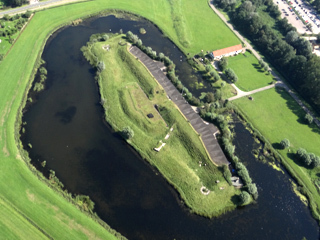 Floating ammunition storage was in boats on the nearby Side canal G of the North Sea canal. Most buildings are still present. Has one of the two remaining gun turrets of the Defence Line, with two 10.5 cm Krupp-Gruson guns. Completed in 1912 and was used as a military prison from 1918 to 1950. From 1945 the inmates were collaborators with the German occupation. After 1947 drafted soldiers who refused to fight in the Dutch Indies (now Indonesia) against the Independence guerilla where imprisoned here. A few prisoners drew many wall paintings during their incarceration. A hardened road for military purpose was constructed between two roads along canals in 1896. The public roads along the canal were at the foot of the dike to have an unseen and protected access along the road. In 1920 the two wooden bridges were in decay and the road was closed. Uniquely this road survived as it was after the closure in 1920 and is very visible in the landscape. Earth rampart to shortcut a lob of the Starnmeerpolder (reclaimed land) between another polder and a canal. Only 460 metres in length and around 50 metres of it remains. The profile of the rampart allowed protective positioning of infantry and artillery. The bombproof building was completed in 1904 and the fort has a secondary battery to the East. Now in use as a fire brigade training centre. This fort was planned to defend small inundation areas and to support offensive action. The area was obtained but by 1888 offensive action was no longer part of the military objective. It became a ammunition storage depot and is now an industrial estate. This battery was planned to defend small inundation areas and to support offensive action. The area was obtained but by 1888 offensive action was no longer part of the military objective. It became a mobilisation centre until 1989 and is now a housing-estate. This fort was planned to defend small inundation areas and to support offensive action. The area were obtained but by 1888 offensive action was no longer part of the military objective. It is is now a housing-estate. A 4880 metre long dike, to accommodate partial inundation of several polders around the village of Krommenie. Beside two secondary batteries, several pipes and oak sheet-piles were also part of the dike. Most of the route is still visible with some remains of the earth wall and other original elements still standing. Built between 1900 and 1903 for 275 soldiers. Has a large forward building. The secondary battery to the East is now part of the back yard of a house. Also built between 1900 and 1903 for 171 soldiers to defend a railroad access. A concrete secondary battery lies to the south. Now used by the Royal Airforce Association and a volunteer Defence Museum is being established. Around 1893-1895 an earth wall was constructed to by-pass an inundation dike. The wall was only intended to provide gun positions and protected movement of troops and material. Completed in 1899, it is one of the oldest forts of the Defence Line. During WW I a searchlight with shelter was added. Now in use as the Air Warfare Museum of the Aircraft Recovery Group Association. The old sea dike functioned as a secondary Defence line since 1895. The small inundations in this area near the coast required this backup. Three bomb free ammunition depots, one which is now demolished, were located in the dike and several batteries could be constructed when needed. Completed in 1899, it lies in the engineers' dike which is the 1st Defence wall. The canal in front of it (Side canal A of the North See canal) was especially made to provide the inundations of most of this sector with water. An earth wall, constructed in 1894 and 1895, to allow inundation of only the western half of the polder. Where existing roads crossed the wall, ground depots were placed on either side of the road to close the access during a mobilisation. For existing canals, four barrage sluices were built. One has since been demolished. This fort has an advanced position, close to the North Sea canal which it would defend. The bombproof buildings were built between 1897 and 1899. Only the advanced building with the turret remains, the main building was demolished by the company owning it. The sale of this fort ignited interest in the Defence Line and its preservation. The 1905 swivel bridge had two pillars in the middle of the North Sea canal protecting the open bridge from collisions with ships. These pillars had each a casemate with a 7 cm gun to prevent ships passing the bridge. Replaced by a tunnel in 1957 and demolished. Constructed between 1900 and 1903 along the North Sea canal, behind Fort near Velsen. This defended the canal, its dikes and the higher level area which could not be inundated. Since 1914, a separate position existed with the Coastal Fort near IJmuiden, comprising two coastal batteries, two land batteries and trenches around the mouth and the sluices of the North Sea canal. Extended and used as part of the Atlantikwall by the German forces during WW II. Advanced position near (and after 1929, in) the mouth of the North Sea canal. Build between 1882 and 1890, it defended the canal, important for the inundations and the main artery of supplies and allied forces, which was completed in 1876. It has seven guns but was soon outdated and in 1939 a trial firing caused a wall to collapse. Already in 1893 plans emerged to build a second fort near IJmuiden with 28 cm guns in turrets to improve the range of the guns and be able to counterattack modern enemy gunships. As part of the coastal defence the plans stayed plans and priority was given to other forts. In 1920 all construction on coastal forts was cancelled and the fort was never build. 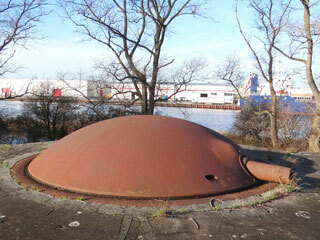 Between 1932 and 1939 four light coastal batteries were build around the IJmuiden harbour. Two had 3x 12 cm guns and two others had 3x 7 cm guns. A heavy coastal battery was planned but building never started before May 1940. The locations of the batteries were re-used by the German occupational forces and there are probably no remains. During mobilisation many temporarily batteries and infantry-posts would be constructed. Such as this small gun battery, made from wood, earth and straw. It was located in a (vegetable) garden of a house along a road. After the Great War ended, these batteries were cleared again.